Glorious India Expo, scheduled on 27-28 May 2017 at Edison,New Jersey, USA, continues to draw attention from a wide spectrum of business and trade community across the country. Road shows are being organized in all major cities of India to promote the event and the responses have been overwhelming. 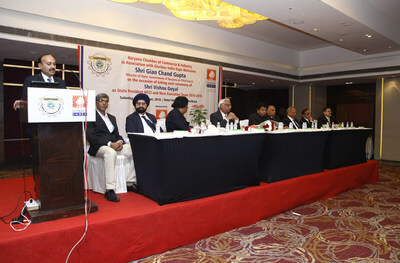 Glorious India road shows have been organized in Ahmedabad, Mumbai, Chennai and Chandigarh so far. The recent road show held at Chandigarh in association with Micro, Small and Medium Industries Association, Rajpura witnessed vast participation of its members. "Over 10 members booked their stalls at the road show and we are expecting many more," said Diptej Patel, Director at Praveg Communications Limited, the organising company of the Glorious India Expo. A similar response was received at the road show organized for Sangrur District Industrial Chamber. Meanwhile, Haryana Chamber of Commerce and Industry has committed a large participation of its members in Glorious India Expo after the road show held for the Chamber at Chandigarh in December last year. In Chennai, a large gathering of Jewellers was seen at the road show organized in association with Madras Jewellers and Diamond Merchants Association (MJDMA). Many Jewellers expressed their interest to participate in the event. The road show organized for Jewellers Association, Ahmedabad in early January, 2017 received an overwhelming response with many confirming their participation. "We have found the road show to be the most effective medium to promote our event. It gives us an opportunity to understand the prospects''' expectations and add further value to the event. At the same time, the prospects find more comfort in dealing directly with the organisers with regard to their queries," said Diptej Patel. The organisers plan to conduct many more road shows in the next 2 months to maximize participation in this B2B and B2C mega trade expo. Praveg Communications Limited is the leading event management company with a track record of executing over 600 events in India and abroad. For more than 15 years now, Praveg has created new standards of event design, execution and management with its continuous concerted efforts and commitment to high standards of quality and efficiency at work.